TSAT is a leading-edge time-domain simulation tool designed for comprehensive assessment of dynamic behavior of power systems. TSAT includes a rich model library, state-of-the-art solvers, useful analysis features, and a highly intuitive user interface. Like VSAT and SSAT, TSAT can be used to calculate transient security limits under specified criteria, contingencies, and transfer conditions. 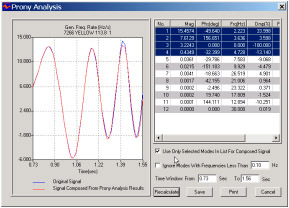 Post-simulation processing tools, such as stability index calculations, Prony analysis, etc.